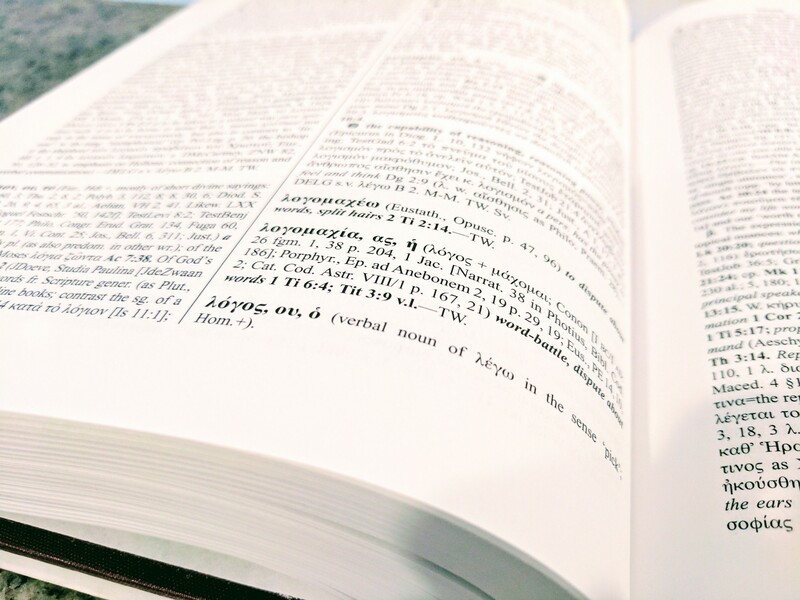 Thinking of dropping a Greek/Hebrew nugget in your next sermon or paper? Make sure these three things are true: (1) you actually know Greek/Hebrew, (2) the point you are making is sufficiently important, and (3) there is absolutely no other way to make the point. I’ve been interacting with a number of students about this, and it seems it would be good to expound on it a bit. And so my next blog series is born! The point of this series is to argue that, unless you are currently engaged in an academic discussion, it is probably best to leave the original languages out of it. In non-academic settings the use of Greek and Hebrew is either wrong-headed or counter-productive. Before moving forward, though, it’s important to note that nothing I’m about to say means that the original languages are unimportant. They are vitally important, for a great many reasons, and if you are training for ministry you should definitely learn Greek and Hebrew if you are able. The question we are discussing here is not “should I learn Greek and Hebrew” but rather “when should I talk about the Greek and Hebrew?” And the answer to that question is “probably not very often.” If you are not currently dialoguing with someone who knows the original languages (or thinks they do), then it is usually counterproductive to discuss them. There are exceptions, of course, and this series is organized around determining whether or not the particular situation you are in constitutes such an exception. tl;dr: it probably doesn’t. Three things must be true before you “prove” or “nuance” or “clarify” something by an appeal to the original languages. You actually know the original languages. There is not other way to make the point that you are making. The point you are making is sufficiently important. We can’t handle all three in this post, so let’s start with the first and leave the others for subsequent entries. In many ways this should be the most obvious principle, but is likely also the most transgressed: before you wax eloquently about what the Hebrew “really” means, you probably should know a bit about Hebrew. I’m not saying you need an exhaustive understanding of the language, or that you have single-handedly produced the best translation of 2 Kings currently on the market, but if you don’t have a rudimentary understanding of the language, and (also) a rudimentary understanding of the way in which languages work, then you probably should keep your mouth shut. Why? Because whatever knowledge you intend to pass on is untested and unexamined, and what is more, untestable and unexaminable (by you at least). Where did you come by that Greek/Hebrew nugget anyway (if you don’t know the languages)? From somebody else, of course! You are taking someone else’s word for it. You have no way of testing or confirming that information. You may trust the source you are quoting, and the source may be trustworthy, but in the end you have no way of arguing with your source because she or he is an expert, and you are not. You are relying on an argument from authority. Now there are situations when you exit the Ordinary and can appropriately assert the authority of another. Let’s consider a hypothetical conversation between me (a theology nerd who can’t do math and has never been to space) and a flat-earther. I don’t have much hope for the fruitfulness of such arguments (since rejection of authority seems endemic to flat-earth ideology), but it might be helpful for me to mention those NASA pictures I saw and the disappearing horizon and the math that others have done. I will do so self-consciously, recognizing that I myself have not “done the math,” and being quite up-front that I couldn’t do the math even if I wanted to. But I would cite the authorities. I wouldn’t cite them (ideally) as MY knowledge or as MY expertise (and right there we have a pretty humbling critique of most of our appeals to authority), but I would cite them, and thereby call my interlocutor to engage my betters. These kinds of situations are rare, but they do happen, so if a group of mormons drops by and starts talking about the Greek in John 1, by all means appeal to the Greek, but do so in a way that recognizes that the knowledge is not yours and point them to the correct authority. Inappropriately using the original languages can have some pretty serious consequences. In this case, the main consequence is passing along false information. Since you do not have the knowledge to check the conclusions, you can’t really know that what you are saying is true. Even the most “simple” translation issue usually has two sides, and it is often the case that those two sides have reasonable arguments to make. How will you adjudicate? What is more, you could end up implying that you are knowledgeable about such matters when you really aren’t. This is especially dangerous when the decision you make contradicts the translation you or your audience trusts. Appealing to what the Greek/Hebrew “really” means will gradually erode your audiences’ trust in their English Bibles. The mainstream translations (ESV/NIV/NKJV/RSV/NASB) were put together by a panel of experts. That doesn’t mean they are always right, or that they don’t have their biases, but it does mean that we are probably not in a position to adjudicate their decisions. Don’t pick a fight you can’t win. How do I do good exegesis if I don’t know the languages? The next logical question is: how do I properly exegete a passage if I don’t know and therefore shouldn’t utilize the original languages? In general, you pick a translation, stick with it, and be humble about your (and its) limitations. It’s often good to compare translations with one another, but resist the urge to decide which one is “better” in this or that instance, since frankly you don’t know. The point of comparison is to see if there are any major issues and debates, not to solve those debates. In your argument stick to one translation throughout, rather than picking the translation that proves the point you want to make. This forces you to stick with what you know and will help you resist the natural desire to overconclude. If you are making an argument that requires the word or phrase be translated thus-and-so, and other major translations don’t translate it that way, then it’s probably not an argument you should be making. That’s not only because you don’t have the required skills to adjudicate the debate, though that is true, it’s also because the argument itself either isn’t very important or isn’t very good (but we’ll get to that in subsequent posts). If you are relying on an individual word or short phrase for your conclusion then your conclusion stands on a weak support. There is a pretty important principle of interpretation embedded here: context determines meaning. The vehicle by which meaning is transported from book to brain is the sentence and paragraph, not the individual words. Translations may therefore differ on words and phrases, but the overall meaning of the paragraph is still clear. Your exegesis and argument should therefore rely heavily on these contextual markers rather than on the grammatical structure and lexical semantics of individual phrases. Bottom line: trust your translation, but do realize that it is a translation and don’t put a weight upon it that a translation is unable to bear.